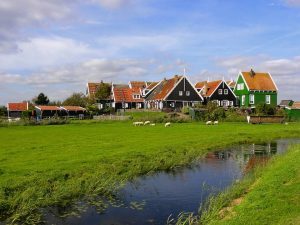 (Beyond Pesticides, April 11, 2019) A recent study of 29 discrete, small European waterways found ubiquitous pesticide contamination. Analyzed samples contained a total of 103 different pesticides and 21 veterinary drugs. These data add to the growing body of evidence that there is a significant, ongoing threat to the aquatic environment as a result of chemical-intensive farming practices. Researchers took a “snapshot” of samples from streams, rivers, and canals in ten different countries: Austria, Belgium, Denmark, France, Germany, Italy, The Netherlands, Poland, Spain, and the United Kingdom. Sample sites were chosen in rural areas with arable land. The water samples were screened for a wide range of pesticides and veterinary drugs using liquid chromatography. The study was published in the journal Science of the Total Environment. Pesticides find their way into water systems via dry deposition (absorption of particles from the atmosphere), pesticide drift, and runoff from contaminated soils. Of the total 103 detected pesticides, 45% were herbicides. Terbuthylazine, a broadleaf herbicide in the chemical class triazine (the same class that contains the U.S.-utilized atrazine), was found in all samples. There were 24 unapproved pesticides in the water samples. Rather than illegal current use, it is more likely that these are leftover pesticides from former, legal applications and are only now leaching into the waterways. This is a disconcerting example of the living history and persistence of synthetic chemicals – they do not disappear after use. The study addresses the complex issue of risk assessment, running into variable regulatory standards and the failure to assess the impact of chemical mixtures. Combinations of chemicals and metabolites (breakdown compounds) may have a greater biological impact than a single compound, but it is poorly studied and under regulated. Regardless, singular compounds raise issues in and of themselves. The researchers utilized regulatory acceptable concentrations (RACs) published by the Federal Environmental Agency of Germany (UBA). Fifteen individual pesticide risk quotients exceeded RACs. For example, one water sample had levels of 2,4-D 8.8 times higher than the RAC. Most of the veterinary drugs in the samples were antimicrobials, and the majority of those were antibiotics. The antibiotic dicloxacilin was present in ~66% of the analyzed samples. Veterinary antibiotics are poorly absorbed by animals; between 30-90% of the parent compound is excreted. Waterways become contaminated with veterinary drugs both directly from the land where the animals are excreting and also from fields fertilized by manure. Antibiotics are highly stable compounds with low environmental degradation rates. Metabolites, breakdowns of the original chemical, can transform back into the parent compound after excretion. While the concentrations of antibiotics are relatively low in the environment, their widespread and consistent use across industries has raised the issue of antibiotic resistance in public health. Concurrent with the onslaught of negative news related to pesticide use is an emergent understanding that farmers can sustain yields and profit margins with reduced inputs. Read more about the impact of pesticides on biodiversity in aquatic ecosystems, or visit Beyond Pesticides’ webpage on the environmental benefits of organic agriculture. This entry was posted on Thursday, April 11th, 2019 at 12:00 am	and is filed under Uncategorized, Water. You can follow any responses to this entry through the RSS 2.0 feed. You can skip to the end and leave a response. Pinging is currently not allowed.